In the fall of 2003, I was fortunate enough to raft the lower Colorado River, below Phantom Ranch, on a trip with the Grand Canyon Foundation. On this trip were five National Park Superintendents, including Grand Canyon’s own Joe Sylvan. Although a good portion of the conversation was about park issues, they always found time to let me stop and paint. This is one of the paintings that resulted from that trip. The view is looking up river from our campsite at Forester Rapids, near mile marker 132. This is a quiet stretch of water is known as Conquistador Isle. Cloud shadows play against the colorful cliffs of Redwall and Tepeats and ancient crumbling lava at waters edge. 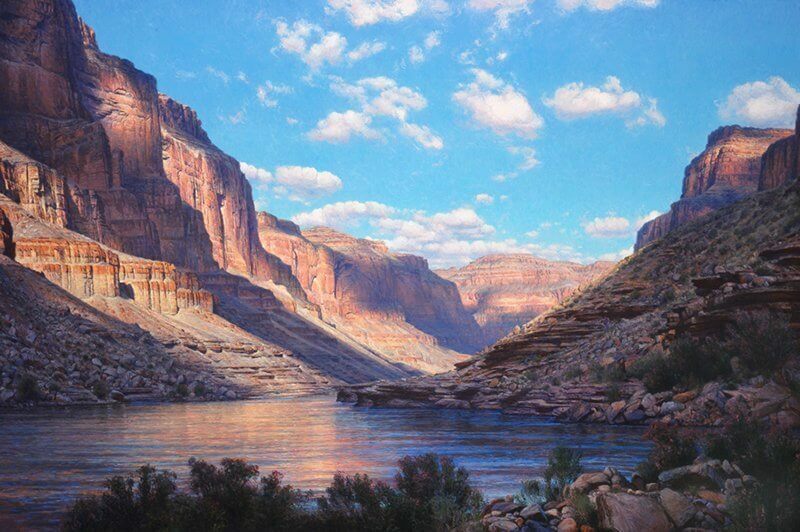 My trips rafting the Colorado thought Grand Canyon remain highlights in my life experiences.